서울의 운송수단별 교통분담율을 살펴보면 2000년 기준으로 지하철 35%, 버스 28%, 승용차 19%, 택시 9%, 기타 9% 등으로 버스와 택시의 분담율은 감소하며, 지하철과 승용차의 분담율은 계속적으로 증가하고 있다. 서울의 지하철은 1974년 1호선이 개통된 이후 1985년까지 2, 3, 4호선이 개통되어 1기 지하철이 완성되었고, 1987년부터 2000년 말까지 2기 지하철이 완공되었으며, 현재 지하철 9호선의 건설이 추진되고 있다. 1~8호선에 이르는 현재의 지하철 수송인원은 일평균 약 5백16만명 수준이며 환상선인 2호선이 180만명으로 가장 많고, 4호선과 5호선이 그 뒤를 잇고 있다. 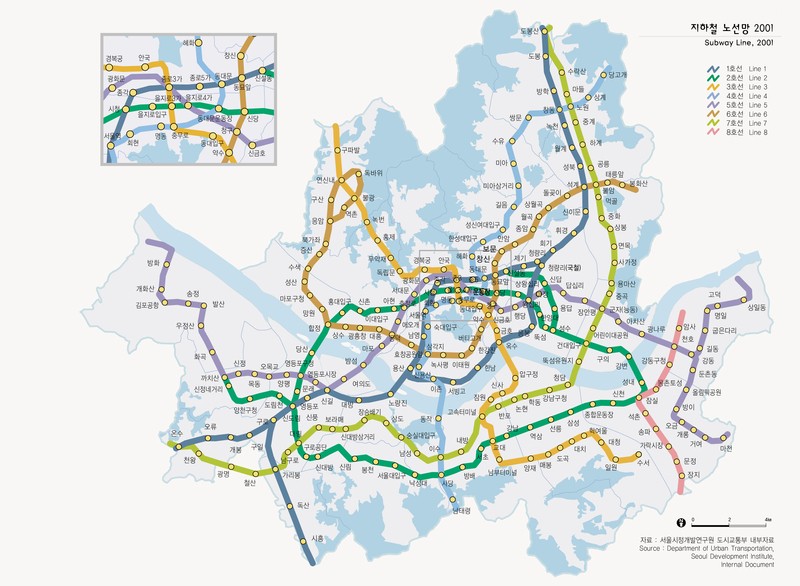 The mode shares of transportation of Seoul as of 2000 shows that the subways take up 35% of Seoul's transportation while buses 28%, cars 19%, taxis 9%, and others 9%. While transportation by bus and taxi is decreasing, the use of subways and cars are continuously increasing. Since the No.1 subway line opened in 1974, the 2nd line, the 3rd line, and 4th lines have been added until 1985, which is the 1st phase of subway development. The 2nd phase of subway development began in 1987 and was completed by the end of 2000. Presently, the 9th line is under construction. As of now 8 subways lines are in operation and they carry 5.15 million people per day. Line No. 2 circular subway transport largest number of people, 1.8 mil. people a day and it is followed by Line 4 and Line 3.